can get to know our company. 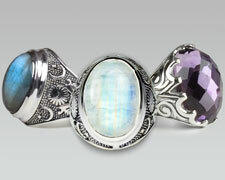 I am offering a free gift of sterling silver and natural gemstones worth over $20 for writing up 3 or more reviews on our new website. This communication helps me to continuously create unique, classic, upbeat, elegant, edgy, and empowering designs that express lasting trends rather than passing fads. In return, your customers get excited to spread the word about your merchandise, and that enhances ongoing sales. More than ever it is especially important to keep customers coming back by keeping them in tune with the times. Customers will be loyal to you, when they trust that you know what is in their best interest. I always appreciate the advice and feedback of my retail store customers. Together we stay aware of what’s new and in style. Click on any product that you like. Write 3 or more reviews and receive your free gift in the mail soon! 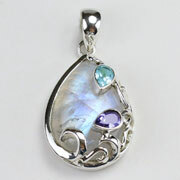 Keeping in mind that most of us have busy lifestyles that often require us to quickly dress up or down, I like to design practical jewelry like the Rainbow Moonstone Garden Pendant. 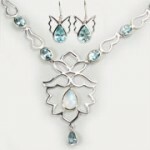 Refined, soft swirls delicately caress a fabulously glowing rainbow moonstone teardrop that is complimented with iolite and blue topaz. The Garden Pendant has a touch of the mystical and dreamy curves reminiscent of the flowing art nouveau style without being overdone. This attractive piece can be worn either as a feel-good everyday casual favorite, a subtle statement of graceful power in the workplace, a charming conversation piece at a party, or a romantic touch for those special times. It is also available in glowing Labradorite. Today’s consumers are more educated on the pulse of the economy. They make it a point to be aware of how they spend their money. They prefer purchasing something reasonably priced yet with lasting value. At the same time, the trend in jewelry has been moving toward lots of color, so what better way to have both color bling and good value than natural colored gemstones that compliment the fashion colors of the seasons set in fine sterling silver? It holds its worth forever and attracts baby boomers and millennials. 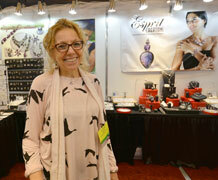 We were a big hit at the Atlanta Jewelry Show in Aug. 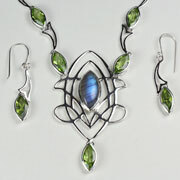 Jewelry retailers were excited to put our eye-catching jewelry in their stores to attract customers attention.